This recipe was shared on the Medifast face book page by Norman Walker. It was his son's own personal creation! I haven't tried this recipe yet, but I wanted to share it with you guys because it had gotten so many requests! By the photo alone, this recipe looks delicious! Not to mention, I am a huge fan of the original Caesar chicken wraps that aren't on plan! You know the ones with those higher carbed tortillas. Yeah, that would be the one! Now I can satisfy my craving for those yummy wraps and not fall off plan! Thanks to Norman's son! These would also be wonderful on the revolution rolls as a sandwich! I will be making them soon, but here is the recipe in the meantime! Enjoy! Slice chicken into strips (to cook quicker) and sauté in olive oil until done. Put all remaining ingredients, except lettuce, with chicken in food processor and pulse about eight times, being careful not to chop too finely. 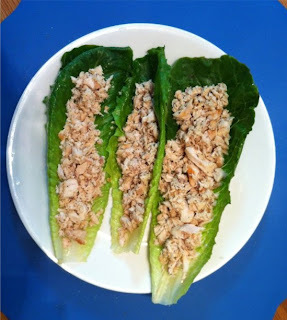 After processing, weigh out 6 ounces of prepared chicken and fill lettuce leaves. Sprinkle each wrap with Parmesan cheese. *Be sure to weigh your romaine lettuce and subtract from your Green!